The D.L. Hughley Show will be distributed by leading Urban broadcaster REACH Media Inc.
REACH Media Inc. today announced that comedian, author, actor and television personality D.L. 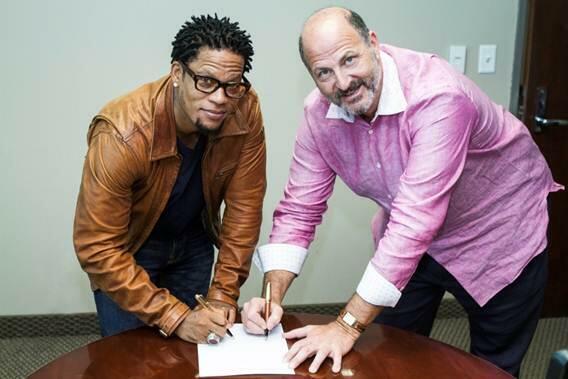 Hughley has been signed to host a weekday radio broadcast, with a launch date to be announced in the near future. THE D.L. HUGHLEY SHOW will be a daily themed, music intensive afternoon drive program from 3-7pm ET hosted by one of the brightest comedic minds. The show will be distributed by REACH Media Inc. which currently reaches an audience of over 12 million listeners, predominantly African American, through radio, as well as digital media. Reach Media did not announce the launch date for the new show, but indications are it will begin some time with in the next two weeks. The D.L. Hughley Show will air on those stations that currently broadcast The Skip Murphy In the Afternoon Show. Also expect some stations that formerly aired the Michael Baisden Show to pick up the new afternoon syndicated offering as well.